Human overload means I find myself writing to you from a pizza joint in Vancouver. Me, a pie, and a bottle of wine. I’m down to my final 50 hours in Vancouver and then I leave on yet another jetplane, taking me to Oaxaca, Mexico, which I believe to my core will be a huge turning point in my travels, my life, and my sense of self. I don’t know why I believe that, but I do. Here’s the thing, though. That doesn’t mean I believe massive events will spearhead those changes (aside from moving to Mexico, that is). Sometimes it’s the simplest of experiences that transform us. Whispers on the wind carry loud truths. Do I believe monumental happenstance will find me in Mexico? No. Or maybe. Either way, methinks it’ll be a place that allows me to reach potentials I don’t yet know exist. 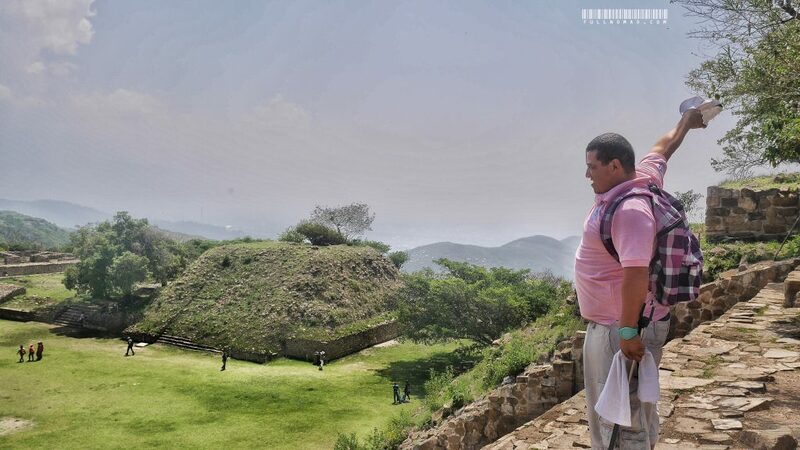 Once i Oaxaca, I would visit this — Monte Alban, amazing Zapotec ruins covering 42 square kilometres at 7,000-feet-elevation on the outskirts of Oaxaca. I felt like this guy did after I climbed the steps! I like to believe serendipity is a giant sign from life saying I’ve made the right choices and my life is about to unfold perhaps not as I expect but exactly as it should. Let’s take Oaxaca as an example. I had heard about it from someone and thought, “Sounds like a neat place, but Mexico’s a murder frenzy, so I’ll pass.” I totally never meant to include Mexico in my travels because of the, what, 100,000 murders in 6 years, or whatever it was. Luckily I’m a research nerd. Oaxaca hasn’t had travel advisories in about a decade. Those murders and the violence, they’re all essentially in two-thirds of Mexico’s states, but most heavily in about half of those, mainly up north. Meanwhile, the final third are places where, sure, there may be struggle and water shortages, but there’s also rich history, vibrant culture, fantastic food, and lovely people. And therein lies Oaxaca. Mexico’s food and art capital is also the land of Mescal and margaritas. It’s inland, far from beaches, high in the mountains, where 2,500-year-old Zapotec ruins lie just 9 kilometres from town. I was back-and-forthing on three different lodgings in Oaxaca, one that suddenly skyrocketed in price, another that was a long hike from the Zocalo (any Mexican town’s centre square), and a third place that was a beautiful space but my Google street-view “walking tour” revealed a dearth of anything interesting in stomping distance. I was torn, and something in me was niggling and telling me it didn’t feel right to book any of them. 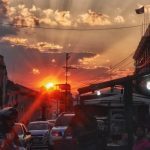 Skimming Instagram, I remembered a travel blogger I held in esteem had been in Oaxaca of late, so I took a look at her feed again. Then I realized she’d been in town longer than I’d thought, so I figured, screw it, I’d ask her what neighbourhood I should park in for a couple months and would then start my search anew based on her recommendations. So I asked. Hey, I’m coming to Oaxaca for at least 6-8 weeks and I’m wondering what neighbourhoods you think I should be trying to find residence in? Next thing you know, she not only replies but tells me to send her an email. So, I did. Long story short, the very day before, she’d gotten wind of an apartment building in the heart of town that never gets vacancies, and had been debating all night whether to lease it so she’d have a winter home next year. And now here I was, saying I needed a space. Serendipitous for her, serendipitous for me. Wednesday, we finally meet, and I take over a sublease on this modest, but cute, little apartment in the heart of the Centro, just a 6-block walk to the Zocalo and the Mercado, where the heart of Mexican urban culture thrives. And that’s serendipity. I ask a random question that, had I asked it two days before, would have had a completely different outcome. I’ll be staying for 40% cheaper than other places I was considering. I’ll trust my “landlord” because I sort of “know” her from her work. I’ll be a skip and a jump from the area that will consume me as I consume Mexico and all its tasty offerings. I’m thrilled. Today, I’m hoping that everything works out and that I fall in love with the city like something deep inside me thinks I might, and that I may even stay as late as Independence Day in September, before I head back to Vancouver in advance of going to Manila for the TBEX Asia convention. Serendipity is the thing that the first 7 months of my travels have lacked. It’s a blend of luck meets magic meets timing. In my previous experiences, it’s been when everything falls in place after I start asking myself if that’s the thing I should be doing. It’s happened a few times in my life, like the year I decided to live in the Yukon, at age 21. Everything fell in place then and I never had a regret about that choice. Oaxaca, I’m told, is a very spiritual place. Filled with light that thrills artists. A beat pulsing behind the musicians calling it home. A place that is a confluence of energy and space and ethereal presence. A Mexican man I met named Emilio implored me to head out to the Zapotec ruins of Monte Alban with a bottle of Mescal, so I can offer a drink to the Gods that stayed behind when they abandoned the ruins, and thus channel the energy he says even now courses under the Earth and through the skies on the heights of those Sierra Juarez mountains. I’m not some new-agey shill looking to hook up with shamans for peyote howls under a moonlit sky, but I probably wouldn’t say no to that experience either. I am, however, someone who believes in energy being, as Einstein thought, something which can’t be created or destroyed. Let me reach all the way back to Croatia for an example. One November Sunday I was bored to tears atop the medieval mountain of Motovun, my home for a month, and I decided to go in search of adventure. 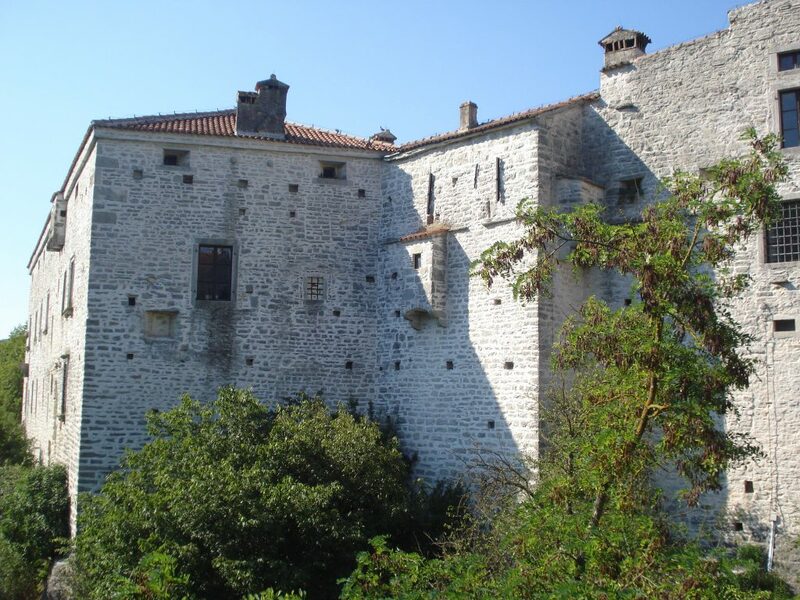 I picked the town of Pazin to drive to and check out. Arriving there, I found nothing of interest but a soccer (futbol) game between high school boys. I sat with the locals and cheered when either side scored, earning myself scorn from dedicated fans. Not long into my watching, the game ended, and I was again left with nothing to do. Off-season in Northern Croatia means there’s not exactly much tourism to woo one. Still, I saw a castle on the horizon, Pazin castle, and decided it was worth exploring. Built in at least the 10th century, the castle had seen 1,100 years unfold around it. I arrived to find it staffed, but otherwise empty. Once again I had ancient ruins all to myself. Sure, I’d pay the meagre $3 or whatever entrance fee. I passed into the courtyard, which felt strange but okay. Then I checked out the old blacksmithing room and other functional areas of the lower castle. Meh. Then I went upstairs. It was pretty disappointing, tourist-wise. Everything was written in Croatian. Lots of pictures but skimpy on artefacts. No thrones or crowns or tapestries, nothing regal or historic, really. Pazin Castle, Wikimedia, Creative Commons 4.0, photo by Silverije. The next room, weirdly, had photos of WWII wartime uniforms, civil uniforms, priests, and other characters of recent historic past, but this was far flung from what I thought I’d be getting myself into with a castle from the Dark Ages. That’s when I noticed the doorway across from that exhibit. In it, more photos. I sighed. So uncastley, dagnabbit! I’d paid up, so what the hell, I’d go look, right? 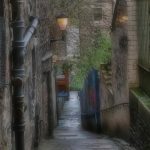 It was a windowless interior room, just a doorway with the thick 18” hewn stone walls making this such a long-standing fortification. So, I entered. Immediately upon crossing the threshold I was hit with the strongest sense of evil and foreboding I’d felt in my life. My gut somersaulted and fell, my hairs stood up, my gag reflex kicked in. I gasped, I felt like I was freezing cold all of a sudden. I turned the hell around and booted it out of that castle faster than my chubby legs have run in a long time. I don’t know what the hell that feeling foretold. I don’t know what those walls have seen in the 11 centuries since they were erected, but something in that room speaks to the notion that energy cannot be destroyed. Evil lingered. If you’ve never studied medieval history and the torture methods they used, you may not have the imaginative scope to truly picture the kinds of cruelty and abuse that might have once occurred in that windowless interior room, but me, I did have done such studies and I don’t want to imagine it, because I’m pretty sure it all went down exactly as the history books tell. It’s not a coincidence that I didn’t go to anymore castles in the remainder of my time in Europe, but I’m sure I will sometime. Despite all that powerful energy, it’s a good bet Zapotecs weren’t fluffy, loving Carebears, given that there was tribal warfare versus the Aztecs and the ruins in question were considered potentially built in light of military threats. Some think they likely even did human sacrifice, which certainly wouldn’t be a reach in that part of the world. But they also participated in rituals, exalted nature, and sought to appease gods like the god of rain and light. I suspect my new friend Emilio is right, that I’ll find a kind of energy there that won’t find me anywhere else. I’m game to go looking for it. After all, just because a place has a history of violence doesn’t mean that’s all the vibe remaining today. You’re looking at a girl who’s stood alone in the middle of a 2,000-year-old Roman Coliseum in the off-season, smack in the arena floor where lions and tigers tore Christians limb-to-limb and slave gladiators fought to the death. That place had an amazing energy, probably because what the spectators felt and cheered for wasn’t anywhere near what those meeting their gory ends felt. No one owns energy. It just happens. One of those small moments I know has changed me. I can’t describe how to you, but I hope to always remember how it felt to stand there at the “edge of the world” that glorious December day in Portugal. 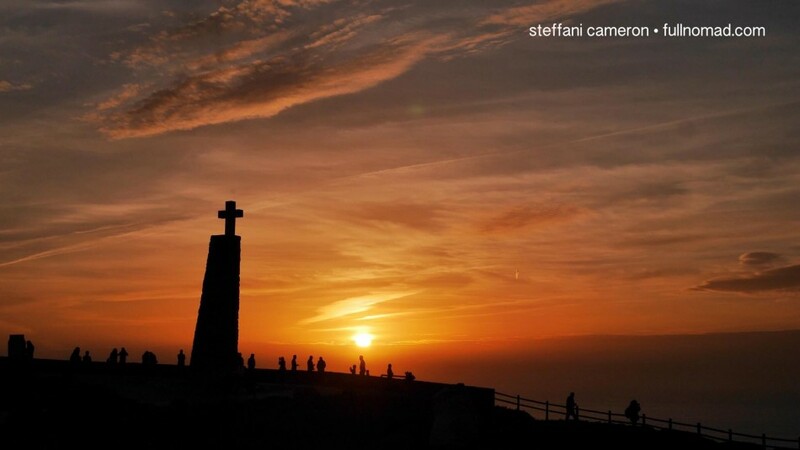 Cabo da Roco. But you ask me what I’m looking for in Mexico and I can’t really tell you. There isn’t anything particular, not beyond some space and time to gather my thoughts, energy to inspire me, and landscapes to wow me. I want to write. I want colour and culture filling every frame of every photo. I want to practice self-love, be kinder to myself, lose some weight, and change how I’m feeling. It’s funny, I’m editing this piece on slowing down and I’ve just received word from work that it’s slowing down and they want to give me fewer hours. See? Serendipity. And yes, I’ll take those fewer hours. I’ll slow down and appreciate how life doesn’t need to be a whirlwind to feel the winds of change. I’ll stop packing my bag every week or two. Hopefully some local people will soon know my face and wave at me with a warm smile of recognition. Will Mexico be everything I hope it will be? Probably, because I can’t tell you what I hope it’ll be. I haven’t done much research. I don’t have preconceptions. I don’t have a wishlist I seek to fulfill. All I’m hunting for is good food, a safe place to write, and a hot sun that’ll melt me into submission. I think those, if nothing else, loom large on my horizon. But hey, serendipity teases me with the promise of something unknown, something more. And I’ll be there when it delivers. This Steff is going south, kids. Stay tuned for the Mexican chapter of Full Nomad. Ooh, I will be very very interested to hear of your travels to the ruins.